The brain and spinal cord are enclosed with the meninges which consist of three protective layers: the dura mater, the arachnoid mater and the pia mater. This image depicts the cranial meninges which covers the brain. The dura mater, the outer layer, is a tough, fibrous covering that adheres to the bones of the skull. 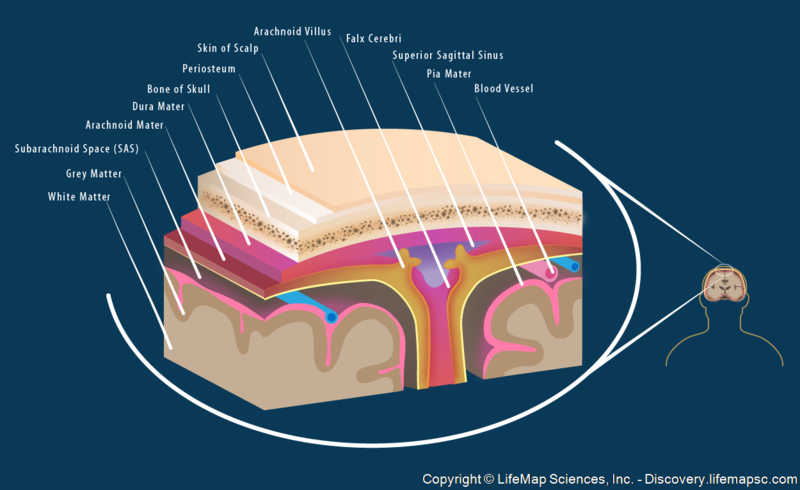 The middle layer is a delicate web of tissue called the arachnoid mater. The pia mater, the inner most layer, lies closely over the brain and spinal cord. It is thin and vascular, and contains many blood vessels that supply oxygen and nutrients to the nervous tissue. The subarachnoid space (SAS) is the space between the arachnoid layer and the pia mater and contains the cerebrospinal fluid (CSF). The two layers of dura separate to form dural venous sinuses, such as the superior sagittal sinus. The arachnoid villus protrudes from the arachnoid mater and allows the CSF to exit the brain and pass into the superior sagittal sinus, which is filled with blood. The falx cerebri, which is the largest dural infolding, lies in the longitudinal cerebral fissure that separates the right and left cerebral hemispheres.